Lowdown: A philosopher tests the hypothesis that death is the only way to feel alive. Another Woody Allen movie about Woody Allen, another step in this great filmmaker's downward spiral (need I mention Magic in the Moonlight?). A middle aged philosopher, troubled with himself (Joaquín Phoenix), starts working as a philosophy teacher at an American campus, immediately attracting a young student (Emma Stone, an Allen regular by now - clearly, the guy has a thing for young women). The latter gets into a "friendship" relationship with the former, enough to forget all about her similarly aged actual boyfriend. Amongst other issues, our philosopher sets out to test a theory which goes like this - in order to truly be alive, one must take a life. Thus rolls onwards the chain of events that troubles this incredibly troubled film over its short duration. A movie that, despite its hour and a half duration and a list of credentials measured in the parsecs, is actually quite boring. Emma Stone, being her usual annoying self, made me hope our philosopher chooses his test subjects slightly better than he actually does. Clearly, the existential dilemmas troubling Allen are not doing his movies much good. 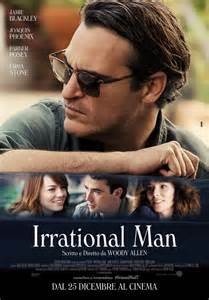 Overall: Tedious to the death, Irrational Man hardly deserves 1.5 out of 5 crabs.